Are you looking for the ideal way to celebrate your recent nuptials? Planning and organising a wedding can be stressful and afterwards you’ll probably want to escape and take some time out. Luxury honeymoons offer the perfect opportunity to connect with your special someone and make memories that’ll last for years to come. Whether you indulge in tantalisingly tasty foreign cuisine or simply kick back and relax on a pristine beach, there are some fantastic ways to spend your honeymoon. Our guide features some of our favourite destinations, hotels and things to do if you ever leave the honeymoon suite! With its swaying palm trees, rich azure waters and pristine white-sand beaches, Bora Bora is top of the list for honeymooners. You can sleep the day away in luxury hotels perched over the sapphire seas, dive under the waves on a snorkelling excursion or hike into the rugged heart of the island. 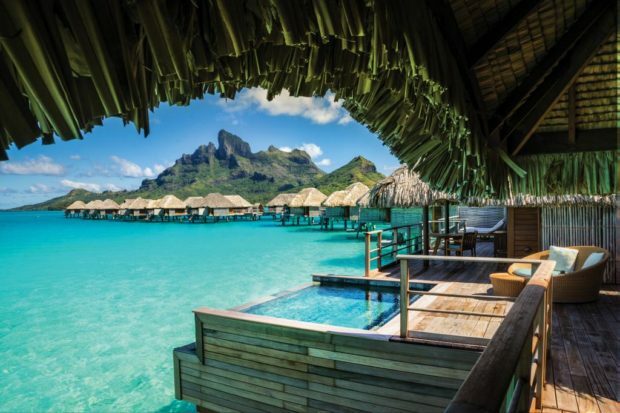 However you spend your honeymoon, Bora Bora is one romantic destination. Matira Beach. Located on the Southern tip of Bora Bora, Matira Beach has long stretches of white sand and is surrounded by lush green hills. This is one gorgeous beach and it’s easy to understand why its recognised as one of the best beaches in the world. Spend your days lounging in the shade of a palm tree, meeting tropical fish under the azure waters or sunbathing with your favourite book in hand. Coral Gardens. For those wanting a more active honeymoon, Coral Gardens is a must. A short distance from the coast Coral Gardens is a breathtaking coral reef rich with tropical fish and underwater life. You might even see Manta rays or loggerhead turtles. Polynesian Spas. Bora Bora has some of the world’s best spas. Traditional spa treatments usually include tropical fragrances and healing oils and are set in stunning locations – some even have glass floors so you can see the fish swimming below you. 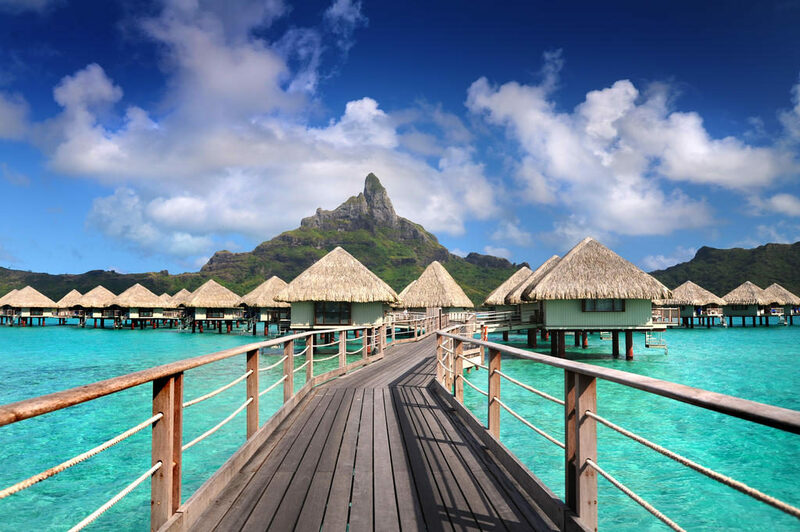 Bora Bora is renowned for all-inclusive luxury resorts with overwater bungalows. Many of the resorts also have private oceanfront balconies, onsite restaurants and spas, and secluded beaches so you can truly relax in style. Le Meridien. Perched over the turquoise sea, Le Meridien has a stunning location in a private bay. You’ll need to take a boat to get here as there’s no road access. Guests can take advantage of the excellent snorkelling and sea turtle reservation, swim in the infinity pool, indulge at the spa or dine at the two onsite restaurants. Four Seasons Resort. Overlooking azure waters, the five-star Four Seasons Resort also offers overwater bungalows and a full range of services. Guests can stay in shape at the fully-equipped fitness centre, lounge on the private beach, or get pampered at the waterfront day spa. There’s also an infinity pool, tennis court and four onsite restaurants. The hotel will also free guided snorkelling tours and other activities. The St. Regis. Welcome to paradise. With overwater and beachfront bungalows, The St. Regis is the perfect escape. Guests can enjoy two swimming pools, four restaurants serving international and traditional cuisine, a private beach and luxurious treatments at the onsite day spa. As a tropical island near the equator, Bora Bora’s weather remains relatively consistent throughout the year. With a temperature variation of only a few degrees, the slightly colder months of December and January are an ideal time to visit as trade winds keep the humidity low. Also known as “the island of eternal springs”, Madeira is a beautiful honeymoon destination. Madeira’s exotic flora and fauna and lush green landscape make it a natural paradise. You can spend your days lazing on stunning beaches, taking a sunset boat ride or exploring the underwater world via snorkelling or scuba diving. You’ll certainly feel the romantic vibes in this gorgeous location. Madeira natural beauty makes it the ideal honeymoon for hikers, walkers or nature enthusiasts. There are plenty of relaxing activities, but most people come here for the outdoor adventures making it a more active honeymoon destination. Cabo Girao Viewpoint. For sweeping views over the island, head to Cabo Girao where you’ll get a breathtaking experience. At 580 metres high, the glass skywalk provides stunning views of the ocean far below you. It’s both thrilling and romantic; especially if you visit at sunset or sunrise. Monte Palace Tropical Gardens. As one of the most beautiful botanical gardens in the world, Monte Palace Tropical Gardens are a must-see for any honeymooner. It’s a romantic experience all-around as you arrive at this surreal attraction via cable car. When you’re walking hand-in-hand through these beautiful gardens, it’ll be easy to find a secluded spot for a kiss. Pico Ruivo. Accessible only by foot, Pico Ruivo is one of Madeira’s most famous and beautiful walks. From the top, you’ll get sweeping views over the coast and nearby mountains. Take a picnic and enjoy the scenery with a glass of champagne — the ultimate way to toast your recent nuptials. 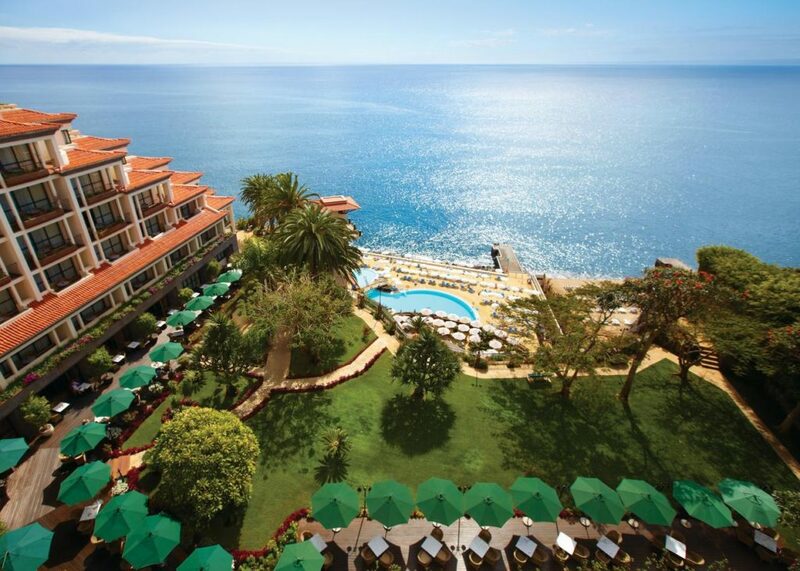 Madeira has many excellent, five-star hotels. Many offering panoramic, sweeping views from clifftop locations and all-inclusive facilities. Staying at one of these renowned hotels makes it easy to never leave the honeymoon suite. The Cliff Bay. Located atop a natural peninsula, Cliff Bay provides sweeping views over the nearby ocean. This five-star, luxurious hotel also offers guests private beach access, indoor and outdoor swimming pools, and two onsite Michelin-starred restaurants. There’s also an onsite spa and fitness centre so you can experience pure relaxation. Albatroz Beach & Yacht Club. Spread across an impressive 450 yards of private coastline, staying at the Albatroz is a memorable experience. Every room has a private balcony with ocean views, ideal for those private moments. The Albatroz also has two outdoor pools and one indoor pool, tennis courts, a golf course, fitness centre and onsite restaurant. Belmond Reid’s Palace. Step back in time at the elegant Belmond Reid’s Palace. Set on top of a cliff with sweeping views of the Atlantic, the Belmond offers guests an all-inclusive stay. You can take advantage of the oceanfront spa, three swimming pools, and direct access to the ocean. Madeira has pleasant and relatively consistent temperatures year-round. Spring is a particularly great time to visit as the Monte Palace Tropical Gardens are in full bloom and the days bring plenty of sunshine with temperatures in the low twenties. Winter brings lows of six degrees, but you’ll still have sunny days. One of our personal favourites, the dramatic, rugged scenery of the Isle of Skye makes it a perfect honeymoon destination if you want to completely switch off and reconnect with nature. Here, you’ll find jagged mountains, velvet moors, shimmering lochs and bays, and imposing sea cliffs. There’s also plenty of whisky and Scottish pride. It’s one stunning location and within driving distance of Edinburgh or Glasgow. Old Man of Storr. A short walk from the car park lies the Old Man of Storr, a towering pinnacle of rock and one of Scotland’s most iconic sights. On a clear day, the view from the top is absolutely stunning — well worth the effort. Quiraing. Even if you only drive through the Quiraing, it’s an unforgettable experience. A winding road takes you up past Scottish hills where sheep graze in the fields. Stop at the top to capture a photo or take a short walk to admire the views over the bay. Dunvegan Castle. The oldest continuously inhabited castle in Scotland, Dunvegan Castle has been home to the MacLeod Clan for over 800 years. You can tour the castle and grounds as well as visit exhibits of the clan treasures including the Fairy Flag. Skeabost House Hotel. 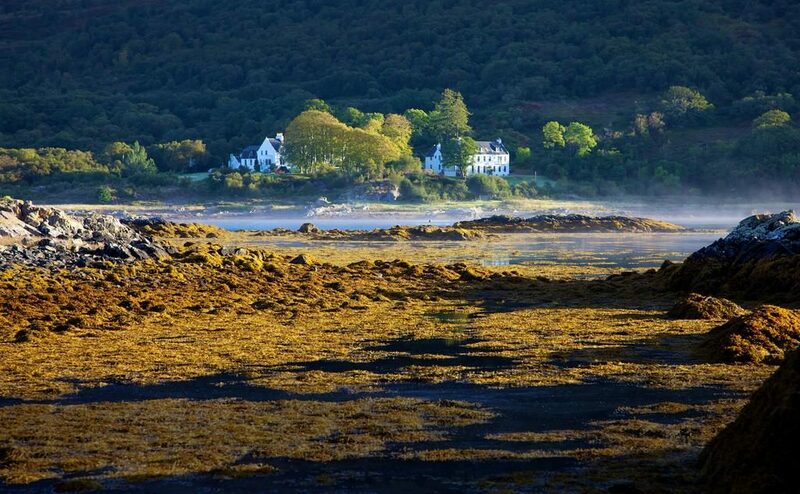 On the shores of Loch Snizort and surrounded by private gardens lies Skeabost House Hotel. Many of the rooms provide atmospheric views of the nearby hills or loch and there’s an onsite restaurant and wellness centre. It’s a popular wedding and honeymoon destination. Duisdale House Hotel. Located in the historic Duisdale forest, this four-star hotel is another fantastic option for honeymooners looking to escape into nature. Many of the rooms provide panoramic views over the Sound of Sleat and are elegantly decorated. There’s also a luxurious hydro pool in the gardens, two onsite restaurants and direct access to woodland walking trails. Kinloch Lodge Hotel & Restaurant. Travel back in time at this four-star former 17th-century hunting lodge. Run by a small family, guests receive personalised service to ensure an unforgettable stay. Honeymooners can indulge in luxurious spa and reflexology treatments at the onsite spa or dine on award-winning dishes in the elegant dining room. Many people choose to visit Skye between May to September. During the summer months, you have the best chance of having good weather and clear skies. You’ll also have plenty of daylight hours. July and August can be particularly busy and best avoided. Winter in Skye brings more rainfall, colder temperatures and shorter days. However, visiting in winter gives you the best chance to see the Northern lights and you’ll have most of the island to yourself.